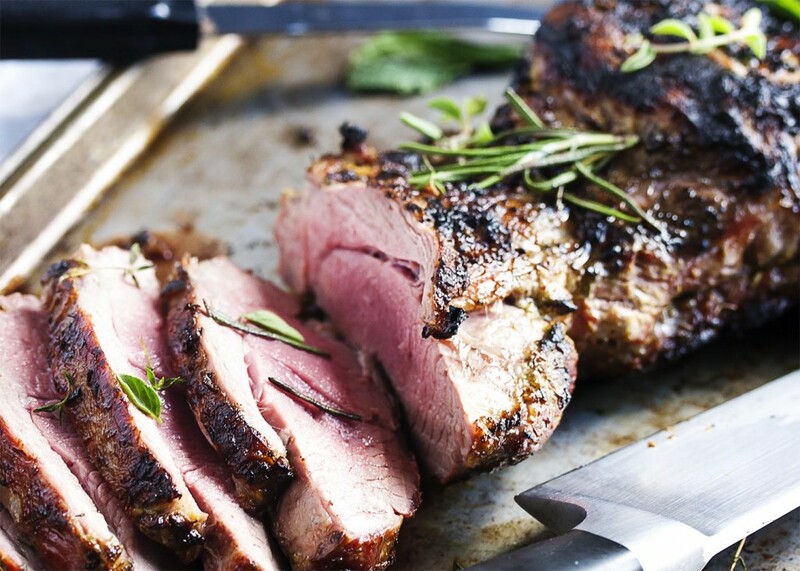 Butterflied lamb is rubbed overnight with a flavorful herb and garlic mixture and then quickly grilled for a great dinner. Lay lamb out flat on a tray. Puree all the herb rub ingredients in a food processor. (Alternatively, finely mince the herbs and garlic with a knife and then stir in the rest of the ingredients.) Spread the herb rub evenly over the lamb on both sides. Cover the lamb and put it in the refrigerator overnight. About one hour before grilling, take the lamb out of the refrigerator and let it sit on the counter. Heat up the grill. For a gas grill, turn all the burners to high and let it heat for 15 minutes. Wipe off most the herb rub from the lamb. Some should still be coating it, but just a thin layer. Turn the grill down to medium high and put the lamb, fat side down, on the grill. Cover and grill for 3-4 minutes, or until well seared. Then turn the lamb over and grill, covered, for about 8 minutes more. Check the temperature and grill for 2 minutes more if needed. For medium rare, the lamb should be 125-130F. When done, let the lamb rest for 10 minutes and then slice.